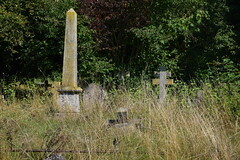 Eye Borough Cemetery is a small and delicious burial ground at the edge of the town on the road to the Thornhams. 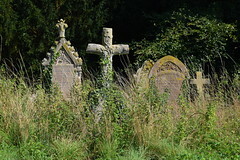 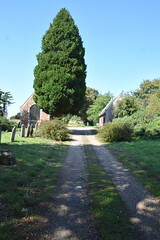 The cemetery was opened in response to the closure of urban churchyards legislation in the 1860s, a mark that until fairly recently Eye was considered on a par with the county's larger towns. 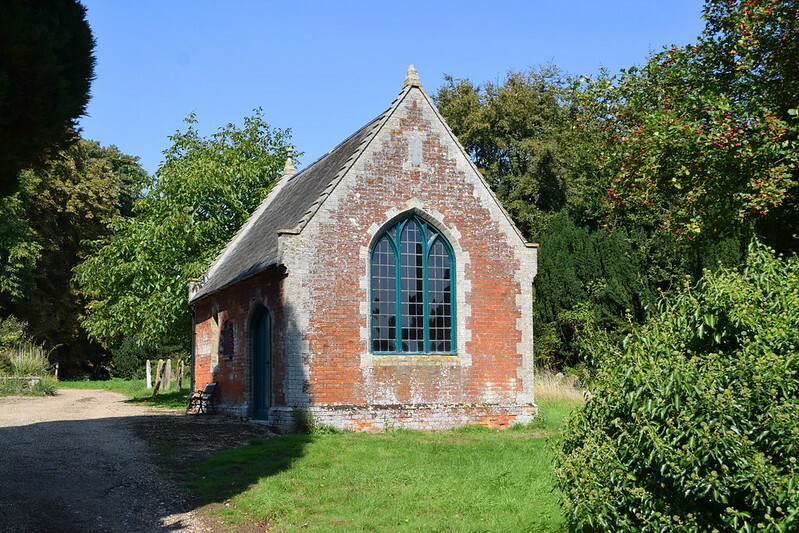 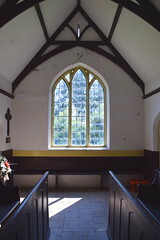 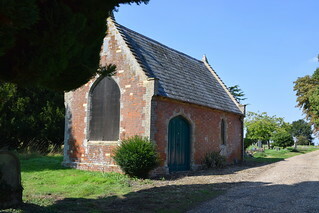 The twin chapels, both simple, even prosaic, sit to east and west of each other, that to the west now closed and used for storage, the east chapel maintained in the High Anglican tradition and open every day. 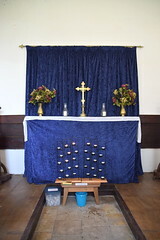 It is furnished by a set of what appear to be oversized choir stalls, which presumably came from elsewhere, and a seemly-dressed altar with candles burning in front of it. 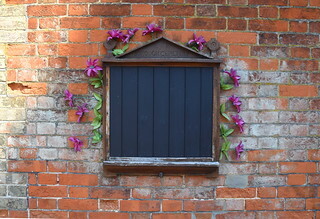 I liked it very much. 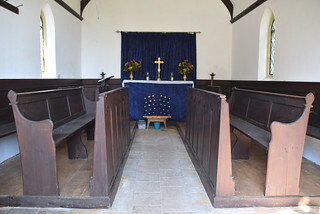 I'd really only come here as a result of a conversation I'd had with a man in Eye church. 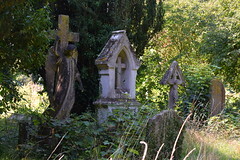 He told me that there was a headstone in the cemetery which had been designed by Sir Ninian Comper, the great early 20th Century church artist. 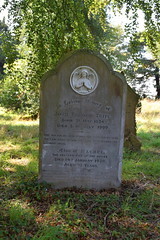 Comper had been a close friend of the Tacon family of Brome Hall, and Maude Tacon was the patroness of Eye church. 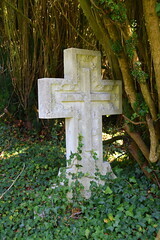 She bankrolled the fabulous Anglo-Catholic makeover of the church in the 1920s and 1930s, mostly the work of Comper, in cooperation with the parish priest John Polycarp Oakey. 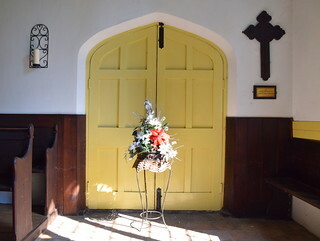 It so happened that Oakey was also Tacon's lover, and the east window by Comper in Eye church is her tribute to him, depicting him kneeling at the feet of his patron saint. 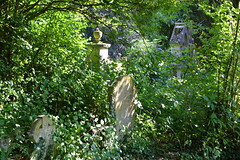 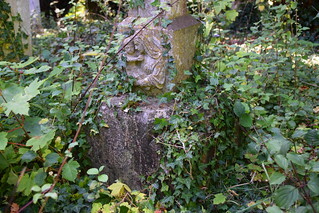 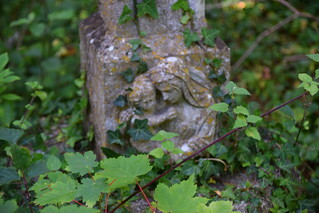 Parts of the cemetery had been left as a conservation area, which was wildly overgrown after one of the wettest winters and hottest summers on record. 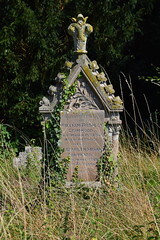 I searched the rest of the cemetery first, but it soon became clear to me that this would be where Maude Tacon was buried. 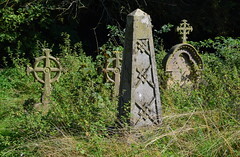 Pushing my way through the rich undergrowth, receiving plenty of nettle stings, lifting low boughs to peep underneath, I was eventually able to get close to four large memorials huddled behind a clump of yews, and as you can imagine I was excited to discover that they were to members of the Tacon family. 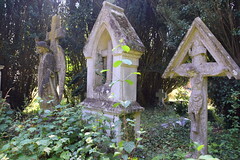 Among them I quickly found Comper's headstone to Maude Tacon, a typical Comper crucifixion with Christ's young head lolling, and at the foot of the cross a delightful Madonna and child. 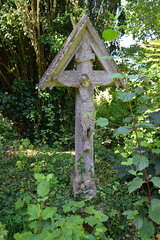 Tacon died in 1953, by which time Comper was 89 (he lived to be 96), but I expect it was actually based on earlier designs by Comper, who had a fair few crucifixions to his name over the years. 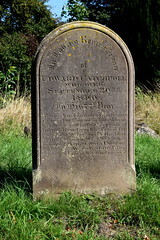 It was satisfying to be able to find the headstone I had come looking for, but I was also able to pay my respects to Edward Catchpole, who died in 1890 and was an honest and faithful servant of the public whom he served for 56 years: by his death the last of the Common Stage Waggoners became extinct from Palgrave, Suffolk. 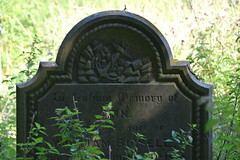 Catchpole's name and trade instantly recalled the much better-known memorial to John Catchpole, his great-grandfather, in Palgrave churchyard, which depicts in relief the Palgrave stage waggon in full flight behind horses. 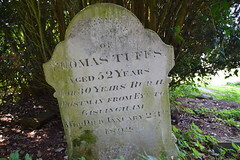 Not far from Edward Catchpole lies Thomas Tuffs, who in 1892 was remembered as for 30 years rural postman from Eye to Gislingham, and also Caroline Smith, who at her death in 1890 had been for four years Housekeeper of Mr G Day of this town. 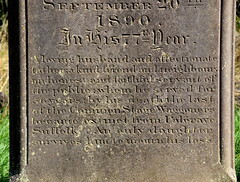 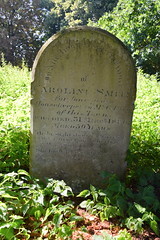 Presumably he paid for her headstone, as a good master no doubt should.